From his trimmed beard to his hairstyle to what he wears, Indian star cricketer and youth icon Virat Kohli feels overjoyed about being appreciated for his fashion sense. He says he finds it fun to experiment with his style and looks from time to time. 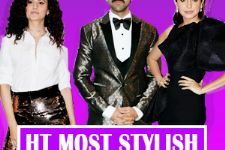 On being idolised as a fashion icon, Virat told IANS in an e-mail interaction: "It sure feels good to know what you wear is well appreciated and liked by all. My sense of style and manner of dressing have evolved over the years. I know what kind of attire looks good on me, and I mainly work around that. It is fun to try out something different from time to time. "I often work closely with my stylist and share inputs while deciding my look." Virat is 29 and is at the top of his game. The Delhi-born India skipper has represented the city's cricket team at various age-group levels before he debuted for India in 2006. He is extremely fit as he maintains a disciplined workout regime. How does he manage his fitness regime in the middle of an important series and while on breaks? "Whether I am in the middle of a series or on a break, I maintain a disciplined regime. My level of fitness has a direct impact on my game; therefore I train hard and follow a strict diet," Virat said. During a vacation, he does not miss his gym routine. "While on break, I go to the gym five times a week, and clock in minimum two hours. Even if I am on tour, I still ensure that I exercise for an hour and a half. I do a combination of weights and cardio exercises, and rarely indulge in cheat days," added Virat, who married actress Anushka Sharma last December. The Royal Challengers Bangalore skipper launched the first performance footwear from the brand evoSpeed One8 for Puma. He says he is conscious about his own footwear. "I am quite particular about my footwear on and off the field. The right footwear makes a remarkable difference on completing a run or affecting a runout. "To play long hours in a test match, you need something that will give you cushion and comfort so that you can last for five days. You need stability and protection for your feet to stay injury free as you are playing back-to-back cricket," he said. He, however, likes the traditional white for his own sneakers. "I prefer the traditional white colour while batting and I like to experiment with colours when fielding. Off field, I like to keep a neat look. I prefer wearing white sneakers," he added.